QuickBooks Hosting is a hosting service that supplies businesses and organizations with a totally functional desktop version of QuickBooks on the cloud in a completely safe and feature-rich environment. With QuickBooks Hosting, CPAs, business owners, and other accounting professionals are able to access their access their accounting documents and other files from anywhere at any given time, using any device. This cloud-based hosting solution effectively eliminates the need for users to constantly request and send accounting files through email. QuickBooks Hosting greatly accelerates accounting-related processes and workflows and simplifies the functions of its users, making them more effective and highly productive than ever. QuickBooks Hosting delivers a lightweight accounting solution that streamlines your accounting workflows and gives you the flexibility you need to perform your accounting-related functions whenever and wherever using your Internet-enabled device. This hosting service is fully optimized and compatible with all devices and platforms. Whether you are accessing your cloud-based QuickBooks system through your mobile phone, laptop, or desktop, the whole experience is guaranteed to be seamless and frictionless. You want blazingly fast speed that doesn’t fail and you get that with QuickBooks Hosting. You enjoy 99.995% Up-time guarantee with the promise of fewer than four hours of downtime for the whole year. The software’s infrastructure is totally optimized to host not just accounting but tax, and business applications as well. With super fast SSD servers, your processes go ultra fast and you save a lot in terms of billable hours. QuickBooks Hosting enables you, your colleagues, clients, and partners to collaborate together effortlessly, resulting in faster and more productive output and better results. Because everything is in the cloud, QuickBooks Hosting helps you reduce your IT expenses as you don’t need to implement an on-premise setup. That means no additional hardware and no maintenance costs to keep up with. What Problems Will QuickBooks Hosting Solve? Its Monday morning, the start of the week and Karen, a CPA, checks her calendar, sticky notes, and emails to line up week’s work. She needs to fix her clients with their accounts in Quickbooks throughout the week apart from her meetings with new clients and other work. She will need to update their Quickbooks files or have someone working for her, update them and send it back to each client and wait for them to revert with their inputs and then work further. Alternatively, she will try to remote into each client’s PC and work with them. This way she faces troubles in terms of slowness while working and most importantly all the stakeholders must remote in and work together and hence requires dedicated time for each client. Luckily, she has hosted her Quickbooks with Ace Cloud Hosting, where all the stakeholders (client user, internal user and herself in this case) can work real time on the same company file and save all important billable hours to invest in prospecting new clients and devote her time in other important areas. The restriction policies offered by Ace Cloud Hosting created a tiered environment for Karen where she can work and monitor all the software(s)/application(s) and data whereas client can see only their respective data and software version. Now all she does is, connect to her cloud server provided by Ace Cloud Hosting which is essentially her single workplace, works there and then; or monitor the work allocated to her bookkeepers and other staff members and come out to attend other pressing matters. Realizing the power of hosted servers by Ace Cloud Hosting, she later added other clients who were using Sage, Drake and hosted her email exchange to simplify her work further. Features – Real-time multi-user access, Single workplace for users and applications, Easy Manageability. Billy is an accountant working for a large enterprise and a freelance consultant. His job requires a lot of travel while he needs to be working for his clients at almost any time. He works from office PC and his laptop at home and would exchange Quickbooks and Excel workbooks over emails. He was keeping up well until his clientele grew to a level where either he needed a solution to manage and collaborate his work effectively for all his clients or give up his freelance work. He started researching online, discussing his issues with friends, peers and anyone who could help him. This is when he came to know about Ace Cloud Hosting’s hosted cloud server. The recommendation came from an old friend and Billy straight-away took a trial with Ace Cloud Hosting and to his amusement, the services helped him more than he was expecting. Now, Billy works on his client files while travelling via his iPhone, on his laptop and home PC while he is at home or office allocated system while he is in office. All the work is automatically synced up and he does not send or version workbook files anymore. One day Billy was at his friend’s when he needed to work, and his phone was causing trouble working. He took his friend’s laptop and started working. Features – Anytime& anywhere access, Any device access, Real-time collaboration. Jesus, CFO of a valves distributor company having an in-hand inventory $32M+ and an annual turnover of several hundreds of millions of dollars, effectively manages his company’s budget in different areas. In a monthly board meeting, he said when it comes to making valves, they are the best. However, when it comes to IT operations, they are far from the word best. He discussed that IT operations must make our overall operations smoother, save them time and help them manage their business better. Instead, they face constant slowness and outage issues, they upgrade the company’s hardware and networks every 2-3 years which is quite costly as it requires set up, storage and back-ups. There is also the need to hire IT people and they demand more manpower they grow in number every day. At the end of the meeting, the board came to a conclusion to explore other options including outsourcing its IT to a trusted vendor. This is when Jesus learned about Ace Cloud Hosting’s completely managed cloud hosting services. Luckily, Jesus got the exact solution he was looking for. In Ace Cloud Hosting he was able to find a company who was best at what they were doing. Ace Cloud Hosting offered services with a guaranteed uptime of 99.995% on super fast SSD servers offering complete server level support coupled with best possible application/software level support. Just like his firm, Ace Cloud Hosting believed in client servicing offering 24x7x365 support via chats, emails and calls by trained professionals with 15 minutes TAT, automated backups, disaster recovery, easy pricing and solution models. After an initial evaluation period, Jesus took all his company users to Ace’s private cloud server designed for their company. Today, Jesus and his company has only a handful of IT people who work in tandem with Ace to support their internal users and focuses only on what is necessary, how to make the best valves. Features – Super-fast SSD Servers, 99.995% Up-time, Laser focus on your business instead of IT. Each enterprise has its own characteristics, and may need a particular type of Accounting Software solution that will be fit for their business size, type of customers and employees and even particular niche they support. You should not count on getting an ideal app that is going to work for every business regardless of their history is. It may be a good idea to read a few QuickBooks Hosting reviews first and even then you should remember what the software is supposed to do for your company and your employees. Do you require an easy and intuitive service with only elementary features? Will you really use the complex functionalities required by experts and large enterprises? Are there any specific features that are especially practical for the industry you operate in? If you ask yourself these questions it is going to be much easier to find a reliable service that will match your budget. 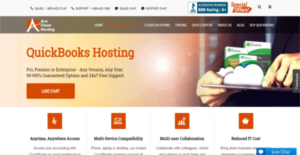 How Much Does QuickBooks Hosting Cost? Ace Cloud Hosting offers the following SMB and enterprise pricing packages for users to choose from. Give the details a look, and select the best plan for your business. To know more of their enterprise pricing details, contact the vendor. We realize that when you make a decision to buy Accounting Software it’s important not only to see how experts evaluate it in their reviews, but also to find out if the real people and companies that buy it are actually satisfied with the product. That’s why we’ve created our behavior-based Customer Satisfaction Algorithm™ that gathers customer reviews, comments and QuickBooks Hosting reviews across a wide range of social media sites. The data is then presented in an easy to digest form showing how many people had positive and negative experience with QuickBooks Hosting. With that information at hand you should be equipped to make an informed buying decision that you won’t regret. What are QuickBooks Hosting pricing details? What integrations are available for QuickBooks Hosting? If you need more information about QuickBooks Hosting or you simply have a question let us know what you need and we’ll forward your request directly to the vendor.